The result of the Theraderm® Skin Renewal System is a maintenance system that produces phenomenal restoration of health and natural beauty to skin. Taking only minutes a day, it’s easy to incorporate into a routine. It was a natural progression to start a company to provide these products to other physicians for their patients. New advances in cellular biology have allowed Therapon Skin Health to create better solutions and preventions to an ever widening circle of skin problems. 1. Why are Theraderm® products superior to other skin care products? Therapon’s philosophy mandates that each Theraderm® product evolves only in response to medical need, that the product will solve the need or improve the condition, that it will be the most effective that it can be, and that it will have minimal irritability. Any of our products must be proven superior to other products in a clinical setting before we even consider adding them to our product line. The Theraderm® Skin Renewal System is designed so that each of the Theraderm® products may be used in conjunction with one or more other Theraderm® products to achieve the maximum result. 2. 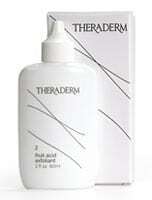 What skin types will benefit from Theraderm® products and how will these products improve the health of my skin? All skin types of all ages will benefit from Theraderm® products due to the fact that they promote the natural restoration of health and natural beauty of the skin, regardless of age or damage incurred. The benefits to be seen from using the Theraderm® Skin Renewal System include a more even skin tone, a silken smoothness to the touch, a decrease and elimination of breakouts or problem blemishes, and a lessening of the appearance of fine lines. 3. How long will it take to see results from using these products? Any user of the Theraderm® Skin Renewal System should feel smoother, softer skin within two weeks. By four to six weeks, noticeable change such as more even pigmentation coloration and a lessening of fine lines caused by sun-damage and aging can be seen. Many patients who also elect to have a series of chemical peels in a plastic surgeon’s office in conjunction with every day use of the Theraderm® System notice an even greater improvement in their skin. Cleansing washThis soap-free, mild foaming gel uniquely loosens skin oils, deposits, cellular debris, and other residue to allow thorough, gentle cleansing without drying. With its near-neutral pH of 6.9, the Cleansing Wash is particularly useful for sensitive skin or laser/peel irritated skin. It is oil-free, fragrance-free, and color-free, to ensure its compatibility with all skin types. Your skin will feel “squeaky-clean” and totally refreshed! Fruit Acid ExfoliantThis Theraderm® exclusive, water-based product contains 2 fl oz of 10% non-buffered lactic acid, which has been shown to more effectively stimulate new collagen and elastic fiber production with less irritation than other alpha-hydroxy acids. Because lactic acid is a natural metabolite of our bodies, there is no toxicity! The Fruit Acid Exfoliant’s special formula gently exfoliates and refines the skin, producing an invigorating, fresh feeling. This effective exfoliant allows the outer layers of dry skin to release and shed over a few days, stimulating new cell growth in the skin’s deepest layers. Your new cells are rounder, more elastic, and more youthful, leaving your skin wonderfully radiant and healthy. The OPC Reparative Gel is a remarkable development in reparative technology for healing and rejuvenating sun-damaged and aging skin. Along with the soothing benefits of aloe vera and Vitamin E, it contains oligomeric proanthocyanadin (OPC), proven to be the most effective antioxidant known to protect and repair the skin’s collagen and elastin. This unique serum minimizes the visible effects of aging, stress, and other environmental factors. The OPC Reparative Gel is completely oil-free, yet it attracts moisture to the skin through the powerful humectant action of hyaluronic acid, nourishing and conditioning the skin to create a stunning, more youthful appearance. The soothing, lightweight Gentle Facial Moisturizer is the ultimate solution for those with oily or sensitive skin. By delivering moisturizing ingredients such as organic silicone, mucopolysaccharides, and sodium hyaluronate directly to the cells through microscopic liposomes, the lanolin-free cream promotes a healthy skin environment to combat the visible signs of aging. This non-irritating daily face cream does not contain any dyes or fragrances. For Melasma, Uneven Pigment, or Age Spots ENLIGHTEN is an easy to use, effective, water-based solution for lightening sunspots and hyperpigmentation. By containing 3% kojic acid and 2% hydroquinone it acts by blocking the production of melanin pigment at two different steps in the formative process. Thus, it is more effective than many prescription products but with less irritation. When ENLIGHTEN is applied twice daily to age spots, a dramatic difference will usually be seen in an 8-12-week period. Using NuPeel Natural Peeling Gel twice daily with Enlighten can speed results up to 3-4 weeks-still with no irritation! Theraderm® Enlighten contains hydroquinone and kojic Acid and should not be used during the first trimester of pregnancy, although no studies have shown any correlation with these ingredients and problems in pregnancy. Patients must use a sunscreen with an SPF of at least 15 while using Theraderm® Enlighten. 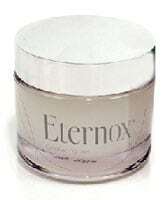 ETERNOX EXFOLIATING GEL (Step One of the Skin Renewal System) gently removes dead skin cells to reverse the visible appearance of each of the seven signs of aging leaving behind soft, smooth, pliable skin. For best results, follow with ETERNOX PEPTIDE REPAIR CRÈME. The Eternox Wrinkle Reduction System utilizes an exclusive combination of three patented peptides, natural antioxidants and micro-nutrients to naturally restore elasticity and skin thickness. Multiple natural antioxidants protect against free radical damage, while natural red algae extracts provide micro-nutrients for skin restoration. Noticeable wrinkle reduction can be seen in as little as two weeks with up to 65% reduction in wrinkle depth and volume after 2 months. ETERNOX PEPTIDE REPAIR CRÈME (Step Two of the Skin Renewal System) contains 3 patented peptides from natural sources to increase skin firmness and smoothness, reducing wrinkle width and depth. For best results, prepare skin with ETERNOX EXFOLIATING GEL. 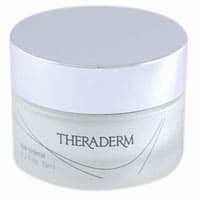 The Theraderm® Peptide Repair Eye Crème stimulates collagen production and helps to reduce the appearance of three things we all dislike; wrinkles, dark circles and puffiness. This natural peeling gel combines research principles with cell biology for an amazing product that reverses the visible appearance of each of the seven signs of aging. NuPeel instantly removes rough, dry keratin surface cells by naturally loosening the glue-like attachments of dead cells to leave behind soft, smooth, pliable skin. Perfect for legs, hands, elbows, feet and face and neck, too. Formulated with 7% lactic acid and 6% lanolin, this superior body lotion is perfect for all skin types. The lactic acid exfoliates dead skin cells and enhances the penetration of lanolin into the skin. Lanolin replenishes the skin’s moisture balance leaving luxuriously healthy, smooth skin. Extreme Dry Skin Therapy is the perfect solution for extremely dry, chapped, or cracking skin. A combination of 12% lanolin plus cocoa butter penetrates to the deepest layers of the skin to replenish its natural oils, while providing a barrier against the elements that cause dry skin. This intense moisturiser will renew the skin’s natural moisture balance, creating a new level of soft, balanced skin. This product is designed specifically for restoration of dry hands, soles of feet, elbows, and is guaranteed to please! Sun protection is a must in order to keep your skin looking healthy. That’s why Therapon Skin Health created Theraderm Platinum Protection, a 30+ UVA/UVB (Broad Spectrum) oil-free sunblock. The special water-resistant formulation will not produce a white sheen, color or residue and will not sting eyes. The 7.5% transparent micronized zinc oxide, 7.5% Octinoxate and 2.0% Octisalate were chosen specifically to protect your skin from the most damaging rays. The Reversion Antimicrobial Wash uses Chloroxylenol to rid the skin of 99.99% of bacteria for up to 12 hours. By protecting the skin from acne-causing bacteria, the Antimicrobial Wash halts one of the main factors of acne before it can begin! The Antimicrobial Wash is gentle and safe for use even on the most sensitive skin. The Reversion Acne Medication works from within the skin, utilizing 2% salicylic acid* to “unroof” clogged pores and 6% lactic acid to stimulate your skin’s natural process of exfoliation. By combining these two acne-fighting ingredients, the Acne Medication stops dry, dead skin cells from building up on your skin’s surface, keeping your pores from becoming clogged and “trapping” bacteria under the skin’s surface, thus effectively controlling future acne breakouts! * if allergic to aspirin, pregnant or lactating, please do not use the acne medication. Simple, pure, healthy, rejuvenating… if these are the qualities that you like in a skin care system, then you have truly found what you’ve been searching for. The Theraderm® Skin Health Renewal System was developed by a board certified plastic surgeon. The principles of medicine, chemistry and nature are simplified in an easy to use, effective skin care system. Theraderm® helps your skin reach its true potential for beauty ~ simply. Optimum skin health is easy to achieve when a few simple steps become part of daily habits. The Theraderm Skin Health Renewal System incorporates four products specially designed and formulated to assist your skin in four specific critical areas of skin health needs. The Theraderm® Skin Health System contains the Theraderm Cleansing Wash, Fruit Acid Exfoliant, OPC Reparative Gel and a Facial Moisturizer.